Universities around the country continue to proclaim that there is no cure and that infected roses need to be removed and destroyed. Also don’t plant any roses in that spot forever! 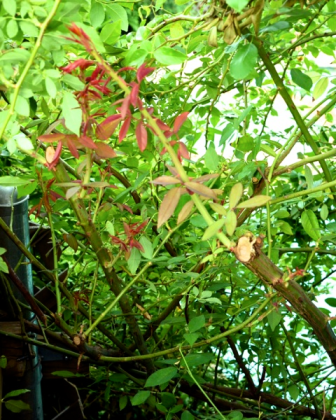 The Knock Out rose seems to be one of the main targets of this “viral-like” disease. Too many of these once thought carefree roses have been planted. Virtual monocultures have been planted in many parts of the country, especially the south. 3) Add hydrogen peroxide to the Garrett Juice spray. Replace a quart of water with a quart of 3% hydrogen peroxide. Commercial products can also be used by diluting them per label instructions to a 1% concentration. Spray plants and beds with Garrett Juice with 32 ounces of hydrogen peroxide added per gallon of mix. 32 ounces (1 quart) less water can be used per gallon.